Full disclosure: Jamie's a friend, a colleague (we were both speakers for Trench Talks), and he sent me a copy of Heart to Start way back when for me to blurb (which I did), but then I got a new iPad, lost all my annotations, and had to find the time to read it again before I could review it. The good news though - the information in Heart to Start is timeless. 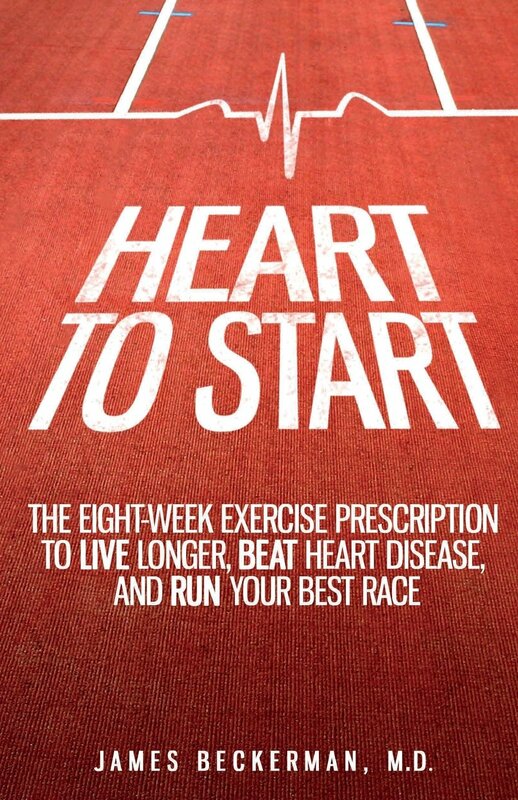 The full title of Jamie Beckerman's latest book is Heart To Start: The Eight-Week Exercise Prescription to Live Longer, Beat Heart Disease, and Run Your Best Race, and he wrote it both as a tribute to his late father-in-law, and as a labour of love for his patients. Having already written The Flex Diet (which I reviewed here), I've no doubt Jamie could have had Heart to Start published traditionally, but rather than go that route, Jamie chose instead to have his hospital publish it so that he could donate 100% of the proceeds to the Play Smart Youth Heart Screenings program that he founded in the name of providing a free service to screen children for asymptomatic heart conditions in order to prevent tragic and sudden cardiac arrests. "I think my dad is having a heart attack"
An hour of compressions later and the paramedics arrived, and though her father didn't make it, his death and that experience changed Jamie's life. Jamie made two promises that day, the first to devote his career to the prevention of heart disease and the second ... you'll need to read about it in Heart to Start's acknowledgments (but I'd bet you might be able to guess what it was). Jamie's compassion and enthusiasm shines through Heart to Start which is designed to serve as a coach not just to those looking to prevent illness, but more importantly, to those who have been given a cardiac diagnosis, or are at great risk for one - a population that may quite frankly be afraid that getting moving might be the end of them. First Jamie introduces you to a simple fitness test to determine whereabouts your starting line lies, and then along with a thoughtful and engaging summary of the research behind them, he helps to guide you from couch to action. He takes you through the quick sitting-rising test and reminds you that those with the lowest scores have been found to have lifespans three years shorter than those with the highest scores. Next is the 6 minute walk test which very simply looks at how far you can comfortably walk in 6 minutes. Those in the lowest 25th percentile of the test had 4x the rate of cardiac events as those in the highest 25th percentile - and if that fact's not enough to make you want to find out where your score lands you, Jamie reminds you that every additional 100m increase was associated with a 30% lower risk of cardiac events! "the purpose of exercise is not to burn calories"
What he's getting at is something I've written about extensively - that while on paper a calorie burned is the same as a calorie not eaten, we don't live on paper. We're not research subjects in metabolic wards, and food serves us in roles other than just fuel. We comfort with it, we celebrate with it, and not only is that ok, it's important! Jamie insists that exercise should never be approached as penance for a piece of cheesecake as if you approach exercise as a punishment, you might be less likely to see it sustained in your lifestyle. Next up is Jamie's Heart to Start Exercise Prescription which in turn could serve as a stand alone cardiac rehabilitation program, or as an adjunct to one that was established and hospital based. 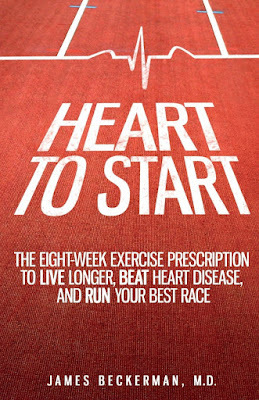 It starts off with an estimation of something called your V02 max which in turn serves to figure out how quickly you ought to be coming off that starting line for what will amount to be an 8 week "cardiac reboot" which covers both aerobic and resistance training. His program has no need for fancy equipment (running shoes and some dumbbells (if you're looking to buy some, check your local online buy and sell style marketplace)) and the workouts he prescribes are accessible, straightforward, and time-tested. And once rebooted, if you're so inclined, Jamie wants to teach you how to run. 12 weeks to go from rebooted to a 5K. Jamie is the kind of doctor that makes us other doctors wish we were more like him. Here's hoping that his book becomes required reading at cardiac rehabilitation programs the world over, that Heart to Start groups spring up like weeds, and that as a consequence of his passion, lives will be lived not just longer, but also better. At the end of the day, if you or someone you love has been diagnosed with, or is at risk of heart disease, following Jamie's $9.99 book will prove a far more powerful medicine than any pill any doctor has ever prescribed. If you want your own copy of Jamie's Heart to Start, here's an Amazon Associates link.